With the wide-ranging travel and 20+ years of writing and editing experience that BoonieLiving LLC partner Bill Sanders (resume) brings, it was natural that something like BoonieLiving Press would be their first project when the husband and wife team moved to Mexico. BoonieLiving Press was first created to publish Richard Orlandini's The Oaxaca Letters in 2008. 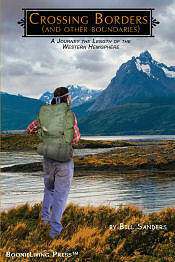 It is now the publisher of Bill's history-making journey the length of the Western Hemisphere in 1970-71. Orlandini, Richard. The Oaxaca Letters of Richard Orlandini, 2004-2008. Ed. By Bill Sanders. BoonieLiving Press, 2008. 273 pp. Illust., glossary, index. From 2004 to 2008, Richard Orlandini wrote long letters he called 'colectivos' to a group of friends and family scattered across North America. The letters are funny, thought provoking, urbane and sometimes profane. They range from travelog (through places the average tourist doesn't know exists) to archaeological musings to political rants to whmisical views of his adopted Mexican pueblita. Sanders, Bill. Crossing Borders (and Other Boundaries). BoonieLiving Press, 2011. 278pp., illustrations, appendices. Or directly from the author by emailing lat-am (at) boonieliving.com, put Crossing Borders in the subject line. Price is $250 pesos. © 2006 - Current Date by BoonieLiving, LLC. All rights reserved.